Chapel of the Franks is a small 12th century Crusader chapel at the Church of the Holy Sepulchre, according to Christian tradition it was here that Jesus was stripped off of his clothes. Also called the Chapel of the Torment, Chapel of the Seven Sorrows of the Blessed Virgin Mary or Our Lady Sorrows, it is the tenth station on Via Dolorosa. The small above ground structure with blue dome and red grills. The Roman Catholic Crusader chapel dedicated to Our Lady of Sorrows, which once provided exclusive access to Calvary. The chapel marks the 10th Station of the Cross (the stripping of Jesus' garments). The chapel contains a beautiful decorative mosaic that covers the entrance, made by coloured glass cubes, natural limestone, and glazed ceramics. Here, in what was formerly an external entrance to Calvary, the Tenth Station is located. Interior of the chapel, the wall on its left side is the location of station 11 of Via Dolorosa inside the Holy Sepulcher. Recently a group of Italian restorers cleaned out the gilded wooden altar that dates back to the 18th century and the painting depicting Mary and John under the Cross. The window in the western wall of the chapel, it overlooks the inside of the basilica. The marble columns and capitals were recently cleaned and renewed along with the polychromatic flooring. Young Palestinians from the Jericho Mosaic Center recovered the precious mosaics in the space above the window. This type of mosaic is one of the rare examples that mixed glass mosaics, natural stone, and glazed ceramics together. The window (pictured above) inside the Greek Calvary chapel (Golgotha), where Jesus was nailed to the cross and where the cross was raised, offers a view inside the Chapel of the Franks. This window was orignally an entrance through the Chapel used to give direct access to Calvary chapel. The Greek Orthodox oratory and chapel, directly beneath the Chapel of the Franks, dedicated to St. Mary of Egypt, a dissolute, who arrived in Jerusalem at the age of 29, and converted to Christianity. The open door to the right is the entrance to the Ethiopian chapel. Chapel of the Franks circa, 1859 CE. The Chapel of the Franks, whose real name is the Chapel of the Torment or Chapel of Our Lady of Sorrows or Chapel of the Seven Sorrows of the Blessed Virgin Mary, is literally against the basilica’s façade at the top of the stairs. 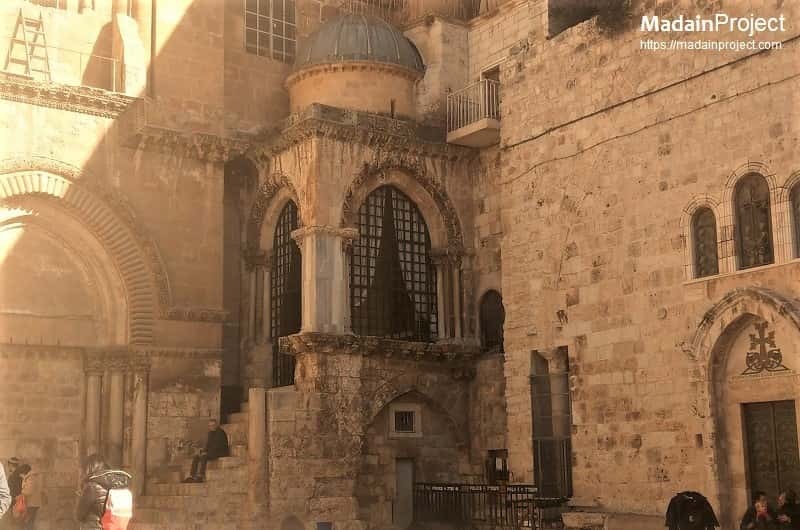 The present church of the Holy Sepulchre has experienced many changes during the centuries. Only a small piece of the original decoration in mosaic still remains in situ, the remaining piece of mosaic that is still over the entrance of Calvary is characterized by extremely good quality in design.